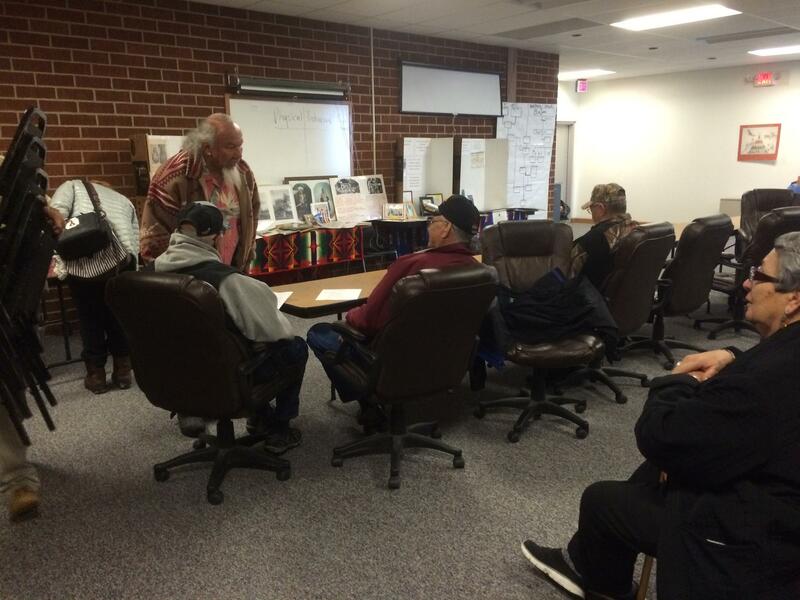 Northern Arapaho tribal liaison Sergio Maldonado addresses the Northern Arapaho elder council. The meeting opened with an elder's prayer. A Rosebud Sioux youth group handed out samples of pemmican, a traditional meat and fruit snack. It’s standing room only in a large conference room in Riverton, Wyoming. Up front, people mill around a display of old photographs of Arapaho children sent to Carlisle Boarding School in the late 1880’s. One is a before-and-after photo of a boy in braids wearing feathers and jewelry; a second, same boy, now in a starched suit and short Ivy League haircut. Soldier Wolf says rather than putting all the photos into a power point, she preferred to display original old photos to bring history to life. Yufna Soldier Wolf is the director of the Northern Arapaho Tribal Historic Preservation Office. The boy in the photo is one of her relatives. She says two years ago, the tribe wrote to the U.S. Army, which now runs a college on the old Carlisle land, asking them to release their ancestor’s remains. She shows a letter to the audience that they sent back telling her, no, they weren't willing to dig up their ancestor’s remains. “The conditions of the graves are fragile and movement would be extremely difficult to move,” she reads aloud. For more than a century, the remains of hundreds of kids from the nation’s tribes have been buried in a grave at Carlisle the country’s first Indian Boarding School in Pennsylvania. Many likely died of disease but for others, the causes are still unknown. Tens of thousands of Native kids were sent to Carlisle and other boarding schools, often against their will. Physical and mental abuse inflicted on them there has had lasting impacts on tribal communities. 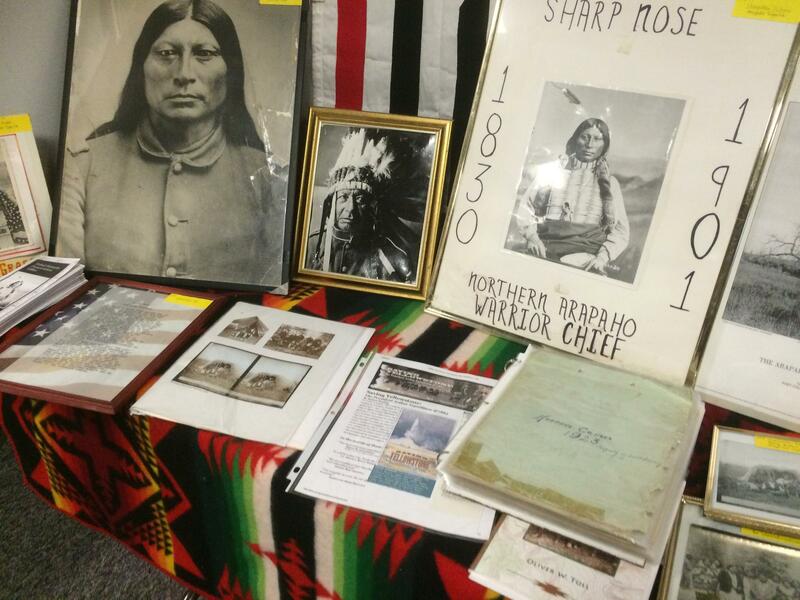 But the Northern Arapaho tribe is now calling on the Native American Graves Protection and Repatriation Act (NAGPRA), a law that allows tribes to reclaim their ancestors’ remains in hopes that a reburial of the children who died there could offer some healing. The Arapaho and Sioux have good reason for leading the charge on this. Their children were some of the first to be sent to Carlisle in 1879. That’s when U.S. Army captain, Richard Henry Pratt, first started the school in hopes of assimilating the tribes into white culture. He says, at that time, the U.S. government was working hard to subdue the Plains tribes and that those first boarding school children weren't just students. That's one thing we're working on is to get the U.S. government to acknowledge their role and the policy and the damage that was done. But tribes can also work toward healing their communities by participating in this process. Landis says, soon, 24 off-reservation boarding schools sprang up in hopes of wiping out Native culture. No traditional religion, clothes or language was allowed in the schools. Hundreds more boarding schools on the reservations-- some run by the government, others by churches-- opened too. Many continued to practice this forced assimilation into the 1980’s. Arapaho and Shoshone member Betty Friday remembers it well. She went to an Episcopal Indian boarding school in remote South Dakota called St. Elizabeth’s in the 50's. There, nuns hit her with sticks, and she saw a priest sexually assault one of her dorm mates. “I remember for some reason I woke in the middle of the night and I could hear her crying and then I saw.” Friday says, and puts a hand to her mouth. The memory obviously still hurts. “And I couldn't figure out why he was there. That's all right, go back to sleep, he told me. When I think about it now I think, oh my god, how many, how many other girls? And boys? Friday says she believes her older brother was abused there, too. She says there’s now evidence that those traumas have reverberated through generations and disrupted tribal family structures. She says her organization is working to heal such historical trauma. She says the first step in healing any trauma is truth telling. Yufna Soldier Wolf says for the U.S. Army to go through the effort of exhuming the tribe’s ancestors would definitely be healing. After the meeting, Soldier Wolf mailed off another request to the army and says, this time she won’t take no for an answer. She says it’s time for the tribe to receive some closure by putting their ancestors to rest. She says the tribe recently developed a new ceremony specifically to be used in the reburial of lost ancestors. To hear the second part of this series on the experience of Native kids at present day boarding schools, click here. Back in 1881, hundreds of Northern Arapaho children were taken from the Wind River Indian Reservation in central Wyoming to the Carlisle Boarding School in Pennsylvania to be assimilated into European culture, but many never returned. Now the tribe is applying to reclaim the remains of 41 of the students who died there. Yufna Soldier Wolf is the director of the Northern Arapaho Tribal Historic Preservation Office. She says she doesn’t expect the process to be easy. Darrah Perez Reads Her Poem "Grandfather, Bless Me With Unity"
Poet Darrah Perez is a native of the Wind River Indian Reservation. Darrah’s work and collaborations honor tribal ancestry and spirituality through her writings and the creativity of the Native American community. She’s the author of two books of poetry, “It Never Happened” and “It Always Happens.” Darrah Perez lives in Ethete, Wyoming. In a classroom at a Riverton activity center kids are sitting in a “connection circle.” They toss a ball around, and whoever has it has got to say what makes them happiest. “I’m happiest when I am around my family,” one girl says before bouncing the ball to a boy. “I’m happiest when I’m riding my dirt bike,” he replies. The idea is that if two kids are happy when they are doing the same thing, they make a connection. It wouldn’t feel out of place at an alternative high school–it’s actually an alternative to juvenile detention. Why Were Six Native American High Schoolers Searched And Detained At The University Of Wyoming? On September 26, six Native American high schoolers from the Wind River Reservation were visiting UW with 600 other prospective students for a weekend event called ‘Campus Pass.’ They planned to tour campus and watch a Cowboy football game. “We got there in the morning, and we had some free time to go walk around and check things out, so we went to the campus bookstore,” says Kaleb Groesbeck.